Nepal extends about 885 km from east to west and up to 241 km from north to south, covering an area of 147,818 square kilometers, as Swiss and Austria together. Closed in between India and China it divides itself into 4 climatic and geographic zones: Terai, Siwaliks, Mahabharat Lekhs and Pahar, the high Himalaya. 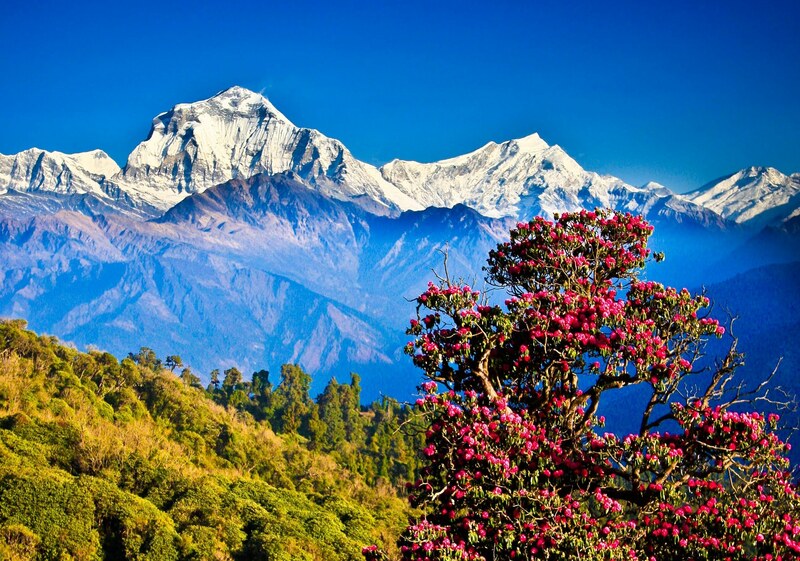 The Terai, downland in the south of Nepal is part of the Ganga plains, once densely forested with subtropical climate. More than 450 birds are found here, and Tiger, Leopard, Buffalo, Elephant, Gharial, Rhinos, are the most famous animals. The jungles are covered mainly with Sal trees and Elephant grass. The inflow of immigrants from other (hilly) parts in the last 30 years and the simultaneously growth of the population has reduced the jungles. More than 10 Million Nepali are settled in the Terai. But here we can see also the tectonic work of the great earth plates, in fact here the Indian subcontinent “crashes with the Asiatic plate, creating all other following zones and many earthquakes. Flooded every year by the rivers during monsoon, the Terai is highly fertile. Beside of this, many industries are settled here. The Nepali are subdivided into two main streams: the indoarian races and the tibeto- burmese races. All together there are more than 30 different tribes and also languages, unified by the languages the Gorkhali or Nepali. The indoarian races come mainly from India and live in the Terai and Mahabarath Leks. Hinduism and shamanism (Jhankri) are there faiths, mixed among them and in the valley of Kathmandu also visible. The tibeto- burmese races are mainly living in the north, in the high Himalayas, mostly belonging to the buddhist faith. In Nepal, religions are very important, main religions are: Hinduism, Buddhism, Shamanism. The religions are interconnected, most Nepal is are Hindu, but the High Himalayas are permanently Buddhist. The valley of Kathmandu is too a stronghold of Buddhism becoming, once because the Newars are believers of both faiths, once because Tibetan refugees are settling in the valley. Shamanism is interwoven with both faiths and you can find “Jankhri” all over in Nepal. The Jankhri play a important role in the Nepalese society. Other religions like Islam or Christianity are nearly not present in the country. Nepal is Official religion is the Hinduism. The Nepalese economy is based upon 90 % on agriculture. The industry produces mostly beverages, cigarettes and processed food. Clothing is connected to agriculture. The main exports are carpets, handicrafts and tourism plays an important role for Nepal. So the social structure is still based somehow in the old days, supported by the Hindu cast system, which divides all tribes into own categories. Of course, mostly Brahmins have economical and political power, only few other have bigger influence, as in the tourism, Manangi, Sherpa does. Politically Nepal is not stable, as democracy is shortly introduced, so governments change often, which is a dangerous problem for the long term future development of the country. Nevertheless, for tourists this means in no way a danger, as the Nepalese do not extend their quarrels to “outsiders”.